Home » Blog » Two more Brightline passenger trains headed our way! All Aboard Florida soon will take delivery of the third and fourth train for its Brightline passenger rail service in South Florida, which the company expects to introduce in July. 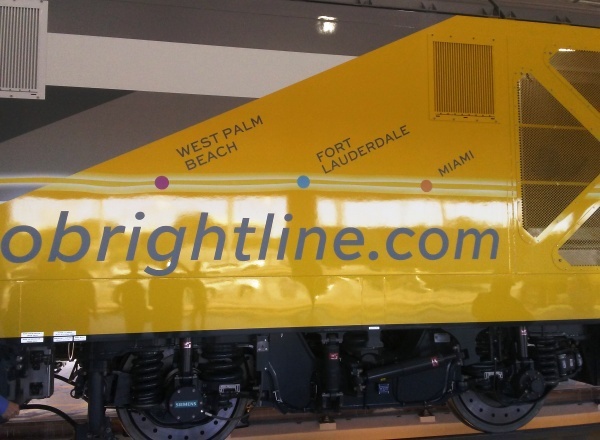 Introductory Brightline service is scheduled to begin between West Palm Beach and Fort Lauderdale in late July, and initial service to Miami is scheduled to start in late August. All Aboard Florida expects to hold a grand opening and officially launch the full three-city rail service in September. Crews are bringing Brightline’s third and fourth trains on a cross-country trip from the Siemens Rolling Stock facility in Sacramento, California, a 60-acre train manufacturing facility where the trains were built. The two trains, named BrightGreen and BrightOrange, will join two others, BrightBlue and BrightPink, at a 12-acre operations facility in West Palm Beach called Workshop b, where trains will be maintained, cleaned and stored. Workhop b also will serve as the on-duty location for train crews when the Brightline rail service starts. Siemens is still building the fifth and final Brightline train, called BrightRed, and expects to deliver it to All Aboard Florida in mid-June.